“Without delving into fine detail, the book portrays enough aspects of living with ASD to be familiar to those on the spectrum and those who care for them. 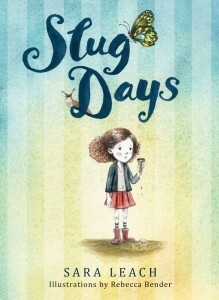 From agendas (the Canadian version of IEPs) to a teacher’s lesson on making friends to a father staving off a tantrum during a project by using clever redirection, Slug Days weaves in challenges with ease. 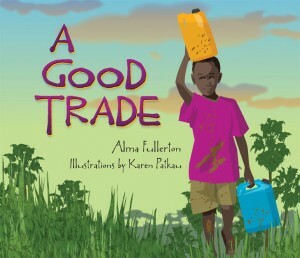 “Fullerton notes that in Tanzania and other parts of Africa, there are still millions of people who cannot afford transportation….Some NGOs donate bicycles and open bicycle libraries where children can sign out a bicycle. 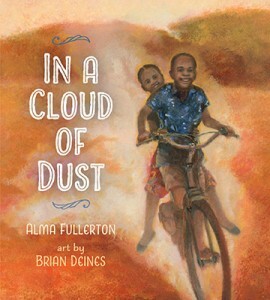 In a Cloud of Dust lists organizations in North America that donate bicycles to Africa….Learning more about these organizations and doing fundraising in your classroom could be great book extensions for intermediate students. 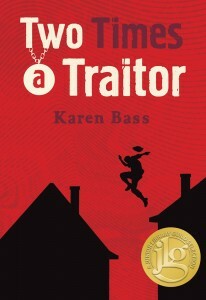 “To utilize a thirteen year old and place him directly in harm’s way proves to be quite a zany approach to tackling historical fiction, and a young reader will certainly relate to the main character…At the beginning of his other-worldly experience, Laz will try to conceptualize it through electronic texts he wants to send to a friend, but eventually those texts are dismissed for a more genuine attachment to the past, one where Laz will befriend the French defenders in Louisbourg and feel himself conflicted by his initial promise to betray them. 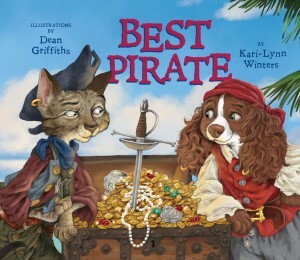 “Kari-Lynn Winters follows the format of the first two pirate books, with playful, pirate language scattered throughout the story and with much of the dynamic text appearing on floating pieces of sail….And the end pages once again feature a glossary of pirate lingo and nautical talk….The buoyant text is mirrored in the dazzling artwork by Dean Griffiths. The wildly colourful and detailed drawings are expressive, action-packed and filled with humour. 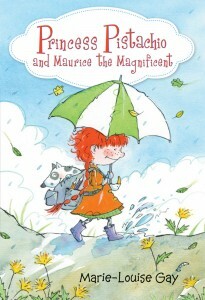 Griffiths’ charming illustrations have depth and pull the reader right into the story. Using these three imaginative titles produced by this talented duo, an enterprising teacher could treat her students to a fun, pirate-themed unit. The fact that each title features an important lesson or moral, with a refreshing heroine, should make this idea even more motivating. “…Like Alba, author Michelle Kadarusman experienced juvenile surgeries for clubfoot, as described in her ‘Author’s Note’, and Alba’s perspective here is delightfully authentic…. Indeed, it is these facts that will keep readers intrigued over and above the more common theme of friendship that binds this story, elevating this novel to a rich and thought-provoking read. A glossary of Alba’s Hummingbird Facts appears at the end of the book…. 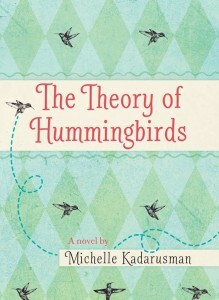 The total design of the book, including its various fonts and hummingbird images, is captivating. In a couple of places, aspects of the story make for excellent critical literacy discussions. Alba’s single mother takes a shine to Alba’s medical specialist; is a personal relationship between them appropriate? And Alba constantly longs to be ‘normal’ until the ending when she decides that her bad foot ‘didn’t have to be normal, because it wasn’t normal that mattered.’ Is Alba really abnormal, or is diversity, and the way we think today about difference, the new normal? Important discussions for classrooms and beyond.